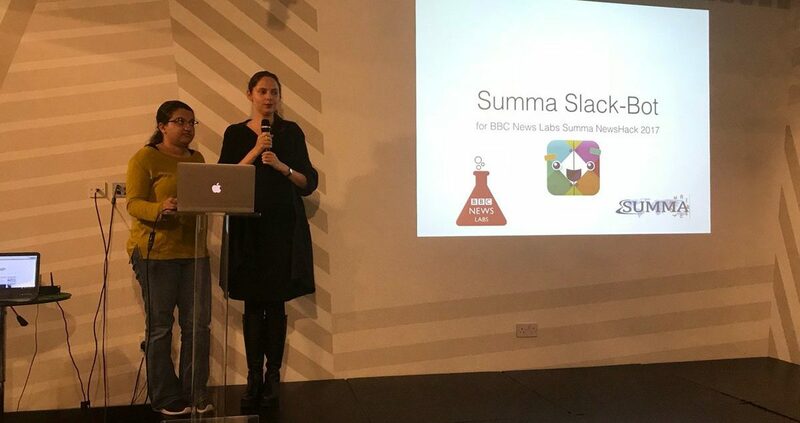 The team representing Deutsche Welle (DW) at the SUMMA Hackathon in London on 21-22 November won the Hack prize for the best journalistic app with their Slack Bot app. Hina Imran, developer, and Olga Kisselmann, Innovation Manager, both from DW Research and Cooperation Projects, worked out an app to run data from the SUMMA platform through a data journalism analysis dashboard and direct the graphical output to a slack channel. This smooth and user-friendly process allows (journalistic) users to access and search the multilingual news platform in their own environment – using the slack tool they are familiar with – and do a cross-lingual search on DW, BBC and LETA content in nine languages, and receive the results in a graphical visualization. The app was conceptualized, developed, implemented, and demonstrated live during this two-day event. The four-member jury deemed this the best app for journalistic use from the 11 competing teams, with direct use potential and fairly easy implementation. The app is to be further enhanced and integrated into the SUMMA platform in the coming months, a nice outcome of the SUMMA hack.